Harley Davidson Sportster in a Norton Featherbed frame, Sporton. 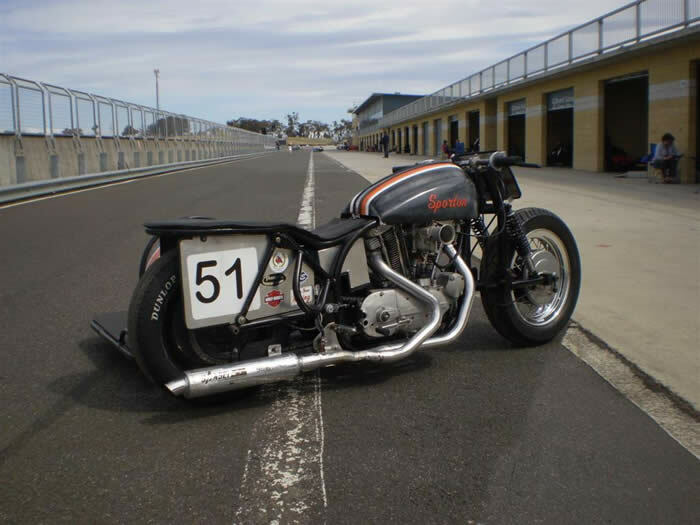 If a Triumph motor in a Norton frame is a Triton then a Sporton is what it has to be. Some ask why not Harlton or even Norley but this is not just a Harley motor, it’s a SPORTSTER, quite a different beast to the pre-unit Harley most are familiar with. In 1957 Harley Davidson unleashed the Sportster on the world. This engine was a unit construction, quad cam, hemi headed motorcycle version of the Chevy V8. Designed to out muscle the British competition and to rule the dragstrips and highways of America. And it did just that. By 1957 the Vincent engine had passed into history. To a great extent simply because it was too expensive. Too expensive to produce and too expensive for common people to buy. And it was common people who bought motorcycles in the 50’s. In America the Sportster engine didn’t quite make it on the road race scene. Cast iron heads and barrels simply retained too much heat for racing. It wasn’t until Harley went to alloy in 1972 that the “Sportster” engine made it’s mark in the form of the XR750. It’s still doing that 40 years later ruling the roost in American dirt racing. No other engine has ever come close to it. The “Ironhead” Sportster engine ruled the American dragstrips for decades. It became a (relatively) cheap and easy way for anyone who wanted to build a 165 MPH, 9 second quarter miler to do so. To say these engines are strong and respond well to some development work is a major understatement. 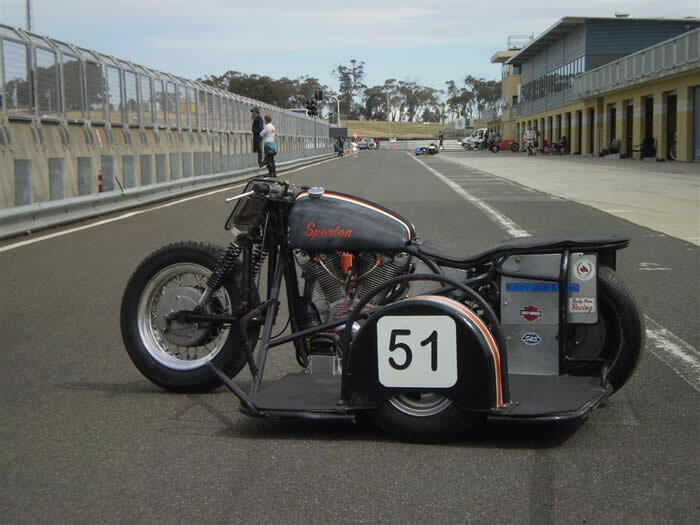 When I decided to build a road racing sidecar it was an obvious choice of engine for me. On the basis that hauling nearly 400 kgs of bike and rider/passenger around needed a torque monster it’s really a “no-brainer”. 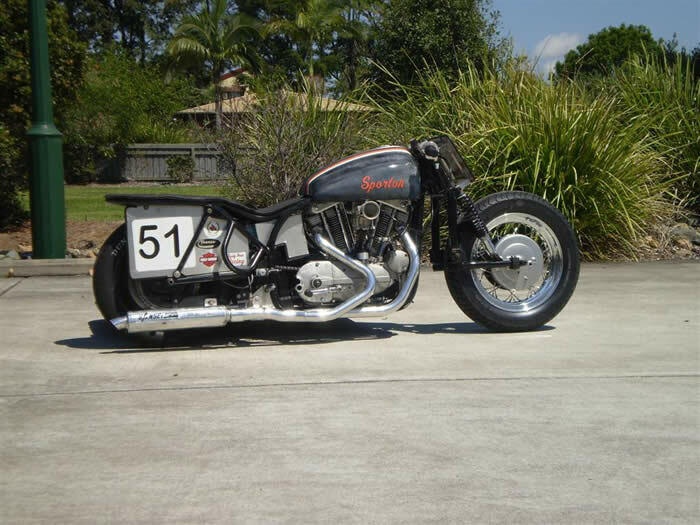 Sportster (all Harley’s really) are very good at producing gobs of torque. And it’s not that hard to increase the stock torque figure by 50 per cent or more. Prior to 1963 (Period 3 rules) there simply weren’t that many engines that lend themselves as well to this kind of work. Vincent’s, yes, if your willing to spend about 5 times as much on a motor. The British parallel twins can be stretched to 850 or so cc’s. But there is simply no way you can get close to the unlimited capacity class of 1300cc’s with them. The Sportster starts out at 883cc’s and stroker assemblies are available from S&S to increase that at about half the price a Triumph set would cost. The frame used in this outfit began life as a “stretched” featherbed frame housing twin Triumph engines. Obvious when you think about it. Two 650cc Triumph engines equals 1300cc’s. A failure to get both engines to run in tandem plagued the bike until it was finally dismantled. Owned by Robert Glock, the remains of the bike was sold to me after Bob had removed the engines and sold them. To make use of it. I cut 6 inches out of the middle of the frame and had Rob Olsen weld it back together for me. The engine is a 1969 900cc HD Sportster engine. Currently it’s fairly stock with the only mods being XLR type valves with Manly valve springs, a mild port job and an S&S “Super B” carb feeding the heads. In the interests of reliability I substituted stock stroke S&S flywheels and rods. Sifton “Scorpion” cams provide a bit more mid range punch than the stock items would have. At the moment the gearbox sports a Trock steel trapdoor and a set of close ratio gears from an XLR. This motor I believe puts out “around 65” HP. But these are REAL honest to goodness American horses, not Japanese ponies. The front forks are leading links with Ikon shocks providing the springing. The brake is a pair of BMW 2 leading shoe items in twin BSA hubs bolted back to back. The rear brake is a hydraulic item originally sourced from a Mini. The rear wheel itself is quite interesting being a composite item I believe graced a Formulae Vee car early in it’s life. It’s a 15 inch item wearing a Dunlop Racing 120/590 tyre. Fabricating the engines mounts for this beast wasn’t really all that hard but many hours of thought went into it before I cut any metal. I wanted the bike to be as “accessible” as possible when it came time to work on it. I’ve seen Vincent engines shoehorned into Featherbed frames that appeared to be a nightmare to work on. The Sportster engine is a “natural” fit into the frame with plenty of room all around for access. It’s very easy to lift the heads and cylinders with the engine still in the frame if need be. The gearbox slips out easily as well being a “cassette” design pre-dating Japanese factory race bike efforts. The ignition system is a rather rare item. Designed and manufactured by legendary Harley racer Mert Lawill it’s a fairly basic, fixed advance, distributor, points and coil system powered by a battery. Yes, a distributor. Same as in your dad’s old Holden. It provides a separate spark to each cylinder in turn (single fire ignition) unlike the stock Sportster dual fire (wasted spark) system. It seems Mert just got tired of magneto failures on his race bikes. Carburation is via an S&S “Super B” long the mainstay of drag racers (and street posers) in the USA. A very simple “side draught” butterfly item that just works. The bike took me 3 years to build, although I could have done it quicker had I had a lot more money to spend on it. This bike has provided me with more outright fun than any other bike I’ve ever owned. And I’ve owned many, many bikes. To me, it’s just what a Period 3 race bike should be. It’s big, it’s loud, it’s reasonably fast and it just plain looks the part. And like virtually all of the race bikes I’ve ever built the bike was “cheap” to build. I would do it again in a heartbeat if I had to. The bike isn’t, of course, for sale at any price. I’ll gladly help anyone wishing to do something similar (See Bruce Marston’s bike) but you can’t have mine as long as my health permits me to race it. Vicki (my passenger and partner) and I attended 6 meetings last year and I can say I had a ball doing it. The people we race with are some of the nicest people you’ll find walking the face of this planet. I’m looking forward to racing again this year. Included in this years planned changes are a “small” stroker motor (1076cc) and a possible move to electronic ignition. As we get more experience with getting the Sporton around the tracks we’re starting to look for a little more horsepower.